Indeed, the Rev. 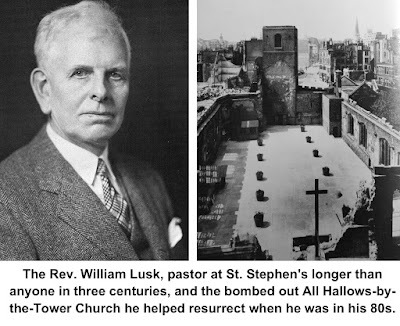 William Lusk, rector of St. Stephen’s longer than anyone in the church's three-century history, had retired in Ridgefield, but was heading off to England on an unusual mission. He had joined the staff of London’s All Hallows-by-the-Tower Church, which despite having been bombed out in the recent World War II, was still holding “open-air” services every day in its roofless building — All Hallows had been holding services daily for 1,275 years and wasn’t about to stop because of a German bomb! Lusk was to minister to the congregation and help London’s oldest church raise money to rebuild. He was 80 years old when he undertook the task. A native of Northern Ireland, William Brown Lusk was born in 1869, and graduated from Queens College, Belfast, where he was a rugby and track star. He came to this country in 1894, graduating three years later from Princeton Theological Seminary. He became a Presbyterian minister in the Adirondacks, but finding the Presbyterians too dogmatic and rigid, he joined the Episcopal Church in 1907 and in 1915, was called to Ridgefield. That was the same year the current stone church building was completed. A year later, a new rectory opened. During his years here, he came to be known as “Daddy,” not only by parishioners but also in the community. Nonetheless, he gained a wide reputation as a preacher, and was often invited to speak at other churches, as well as at the Episcopal cathedral in Hartford and Berkeley Divinity School. One of the first things Lusk did in 1915 was to create the St. Stephen’s Men’s Civic League, aimed at “bringing the men of the parish closer together and to promote free and methodical discussion of questions concerning the social and moral well-being of the community.” To the latter end, the league had an orchestra that played many community concerts. But it also sponsored debates on timely topics, such as local liquor laws and the advantages of automobiles. The league also got involved in more controversial social issues, such as fighting discrimination being practiced against the local Italian population. Lusk led the congregation during two world wars — in World War I, he traveled to France to visit and encourage the troops. He set up a YMCA hut for the Connecticut soldiers in France, where they could relax and have a taste of home. After World War II, he served on the Postwar Planning Board, which aided returning servicemen. After working in England, the Lusks returned to Ridgefield, living on High Ridge. William Lusk died in 1953 at the age of 83. Edna Lusk, also a native of Northern Ireland who was active in the Red Cross here and was known as “Monie,” died 10 years later, age 79.